Keep customers coming back with repeat appointments over a set period of time. With Setmore Premium, you can schedule a whole series of recurring appointments in just a few taps or clicks. First tap the (+) button and select +Appointment. Take the usual steps when booking an appointment by choosing a service and adding a customer. Stop when you get to the final confirmation screen, don't save the appointment yet. 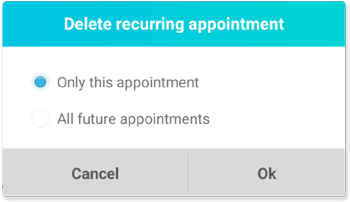 Before you save the appointment, scroll down and tap on the Repeat field to turn this appointment into a recurring appointment. Then, specify the interval of recurring: daily, weekly, or monthly. Once finished, tap Done in the top right corner, and finish booking the appointment. Once booked, all appointments in the series will appear on your calendar until the specified end date. Customers will be notified just once for the whole series (rather than once for each appointment in the series), if you have confirmation emails activated. Reminders will go out for each appointment as scheduled. Watch the video or follow the instructions below to schedule a recurring appointment in the Setmore web app. First, click on an empty space in your calendar to start an appointment as you normally would. In the appointment window, click the toggle switch next to "Recurring?" to activate it. 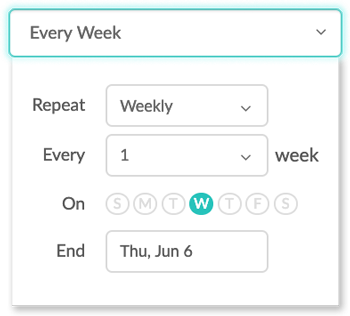 Then, a dropdown menu will appear that will allow you to select the interval of recurring: daily, weekly, or monthly. Use the menu to set your interval. When ready, click the Continue button and finish booking the appointment. Start with the first instance of the recurring appointment that you want to delete. Click on it in the calendar, then click the Delete link in the bottom right corner of the Appointment frame. You'll be prompted to delete only the selected appointment, or all future instances of the appointment. Choose carefully, this action cannot be undone.